Armor Paving Is A BBB A+ Rated Asphalt Repair and Maintenance Company in Columbus, Ohio. ​No two paving jobs are alike. Armor Paving in Columbus, Ohio, strives to understand and address each unique set of needs. We perform all phases of the project in-house. We will design a plan that meets your detailed project needs. Our team has the experience and knowledge to handle everything from material spec guidance to staged construction. Since our start in 1985, we have been performing all types of work from site work to fixing drainage issues. Armor Paving has experts in both concrete and paving for the private and commercial markets. Our extensive client list ranges from local churches and schools to new housing developments. When it comes to road and parking lot construction, Armor Paving can handle it all. We have the experience and the equipment to handle any commercial project. Some of our past projects include parking lots, access roads, shopping centers, apartment complexes, recreational facilities, site work, loading docks, retaining walls, ramps, cart paths, walking trails and much more. Small cracks in your asphalt pavement are unsightly. If those cracks are left unfilled, they will allow moisture to penetrate the asphalt surface. Armor Paving will address pavement cracks prior sealer application. This will provide a more attractive finished appearance and it is an important preventative maintenance. The larger spider cracked areas should be repaired with asphalt prior to the seal coating being applied. A high quality coating will provide two major benefits to your property. 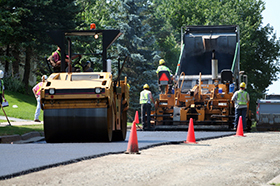 First, seal coating will protect asphalt from damaging factors of Mother Nature. Second, sealer will provide great curb appeal. A new seal coat every year will give your asphalt that new look black appearance. Asphalt Sealer is the best way to preserve the oils, which will help maintain the pavements’ flexibility.